NatureWord – Page 841 – Trustworthy health information resource. 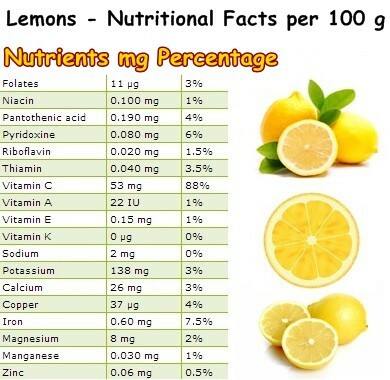 The lemon (Citrus limon) is by far one of nature’s healthiest foods. Lemons are a cross between citrons and sour oranges and they are in season from May until the end of August. They are not only the key-ingredient in one of the most refreshing summer beverages, the delicious lemonade, but they also have several amazing health benefits. The fruit is an important source of vitamin C, providing 53 mg for every 100 g as well as good amounts of iron and vitamin B6. Benefits include improved vitality, elevated energy levels, better breathing, clearer thinking and stronger immunity. Lemons also contain small amounts of vitamins B1 and B5, folic acid, calcium, copper, magnesium and potassium and provide anti-aging benefits, support brain and nervous system health, digestion and cardiovascular health. And despite their unimpressive nutritional value, research shows that lemons (as well as limes) are capable of slowing down the diffusion of the cholera virus. What is interesting is that researchers have not yet been able to identify the phytochemical responsible for this amazing feat, however, they are relentless in their pursuit to solve this grand mystery and reveal the secrets to the health benefits of lemons. What do lemons look like? Round, plum and pointy at one end, lemons are the iconic image of the citrus fruit. They have a slightly bumpy, thick rind followed by a white, spongy pith and the segmented yellow pulp inside. Seeds are typically small, white, round and pointy. The rind is green when the fruit is unripe and turns a bright yellow as it ripens. What do lemons taste and smell like? Lemon taste sour and acidic as a result of a high vitamin C and citric acid content. They make your mouth pucker from the acidity, but their taste is highly invigorating. The rind and pulp are extremely aromatic, with a strong citrus perfume to them. The leaves too have a strong citrus smell. What are the health benefits of lemons? People around the world have always been aware of the curative properties of lemons and made sure to include them in their diet in the hope of warding off illness. In addition to unique phytochemicals, lemons are an excellent source of vitamin C, a potent natural antioxidant and anti-inflammatory. A generous intake not only provides benefits for skin, encouraging collagen synthesis for fewer wrinkles, but also helps relieve inflammation associated with conditions such as arthritis, providing minor pain-relief. Why is vitamin C so important? Because it helps boost immunity, reduces inflammation and protects us from the devastating effects of free radical damage. Remember this: meeting your daily recommended intake of vitamin C is efficient against colds, can alleviate flu symptoms and even help cure recurrent ear infections, among other benefits. Taking supplements daily or eating foods rich in vitamin C such as lemons, strawberries or bell peppers can be an ideal prevention method for many health issues. Moreover, laboratory studies have shown that citrus fruit also contain important phytochemicals called limonoids which are said to be extremely efficient in preventing cancers of the mouth, stomach, colon and skin. A specific form of limonoids is the limonin, a phytochemical easily digested by our stomach. Limonoids in general are potent anticarcinogens, highly efficient in preventing cancer cell proliferation. They are found mostly in the rind of the lemon. But no matter what part of this fruit you like, it is advised you only use organic lemons. This way you can eat both the fruit and use the rind for cooking without risking pesticides contamination. Lemons are also extremely efficient at preventing rheumatoid arthritis because they provide an excellent intake of vitamin C, which is a potent natural anti-inflammatory. Arthritis is a painful condition, but prevention is possible, so try not to avoid this miracle fruit. In addition to this, the vitamin C in lemons can enhance the absorption of iron and prevent scurvy and bleeding gums. In the past, scurvy was the one illness that plagued sailors. They would spend prolonged periods of time at sea, where they had relatively no access to fresh fruit. However, when lemons and limes were included into the sailors’ diet, their health improved significantly as a result of the benefits of a daily intake of vitamin C.
Lemons have come to be appreciated not only for the health benefits they bring, but also for their beauty and utility. For instance, because they are astringent they are used as main ingredients in numerous natural cleaning products. We also add lemon juice to fatty or greasy dishes to make them more easy on the stomach or to simpler dishes to give them flavor. The citrus fruit is efficient at masking unpleasant odors as well: for example, if you eat garlic or fish, eat a few slices of lemon too. This will make your mouth smell fresh and lemony. If your refrigerator doesn’t smell fresh, clean it and place a lemon cut in half inside to preserve freshness. 1) Alkaline food, antioxidant properties, protective action against chronic disease. 2) Strong anti-inflammatory properties, provide minor pain relief for arthritis sufferers. 3) Stimulate collagen production for more youthful, better looking skin. 4) High in vitamin C, reduce risks of blood clots. 5) Clean arteries and prevent cholesterol plaques. 6) Low in calories (29 kcal/100 g), encourage weight loss. 7) Important source of fiber for lowering LDL blood cholesterol levels. 8) Source of carbohydrates (9.3 g/100 g) and B vitamins for energy metabolism. 9) Contain good amounts of iron for a revitalizing effect. 10) Boost immunity and have a protective action against the common cold and flu. But eating lemons is not for everyone. Some people do not respond well to acidic foods and may experience side effects such as: heartburn, acid reflux, worsening of gastritis symptoms, stomach ulcers, teeth sensitivity etc. The higher your intake of lemons and lemon juice, the more severe the side effects. Usually, those with existing digestive problems are the more likely to experience side effects. If you enjoy eating lemons, I encourage you to plant a lemon tree. You don’t even need garden space for it; you can successfully grow it in a flower pot and easily keep it indoors over the winter if temperatures drop too much. This way, not only will you have an abundance of fresh fruit at your disposal year long, but the invigorating citrusy smell of lemon fruits and lemon leaves will change the air in your home and make it an even more pleasant, vibrant and welcoming place.